I finally have a chance to enjoy my two favorite things, Chocolate and Coffee. However I now have the chance to enjoy them together thanks to Awake Chocolate. The latest game changer in the coffee, chocolate and energy market. Each 44g bar is equivalent to one cup of coffee. 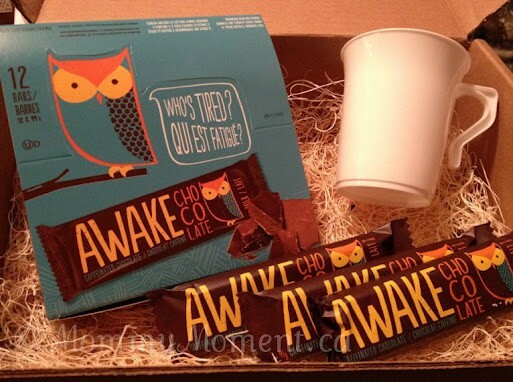 Awake chocolate is marketed for people needing a little pep to keep them going through the day. The perfect afternoon caffeine boost all from this little bar of goodness. Each bar has four partitions so you can be filled up as much or as little as you want. This proudly Canadian company is in the middle of a cross Canada collage tour and may be coming to a university or college near you. Go to their Facebook page for more information about this game changing bar. If you need that extra energy to write a paper, get a post up or you simply want to enjoy a cup of coffee in a chocolate bar form, this is what you need. Easier to carry around than a cup of coffee and super convenient for your active lifestyle. Available at most gas stations and convenience stores and now at most universities and colleges, there is always a bar close to you when you need it. So drink/eat up and get the energy you need from a cup of coffee in a yummy chocolate bar! Sounds interesting. I love plain dark chocolate – whats your take on the taste? As good as the average bar or ‘different’? I agree with the above poster – sound very interesting! What DID you think of the taste?